Hiya guys! It's time for another simple and beautiful nail art day featuring polishes from the Starlight Collection from OPI. As I've mentioned the previous weeks, the press samples here were received as part of the campaign with Preen.Me and OPI for being part of the Preen.Me VIP program. I originally intended for this to be a two month long segment for you guys, but health complications and life ruined it for me. Boo! So unfortunately, this will be the last post for this quick and easy segment for the season. It'll be back though and in the meantime I have other nail adventures in store for you! Enough about that, let's get to our finale look! I adore how this mani turned out because it's so simple and easy. The magic is in the topcoat! You can totally opt out of using a charm for your accent nail. I personally love using charms so any chance I get you best believe I will be blinging it out. I uploaded a quick tutorial for this look on YouTube. You can click below to watch it and there will be an even quicker version on my Instagram for all you quick learners. No, really. There is not much to this look, but you can best believe it'll turn some heads! You want to make playing with vinyls even quicker and easier? Paint your nails the day before! Whenever I know I'll be doing a vinyl mani I quickly put down a base before bed, so when I do my nails the next day there is no chance of lifting. Of course, sometimes that doesn't work out cause I end up changing my mind on the mani color scheme haha. But seriously it's always nice when you don't have to wait around for paint to dry! This is absolutely gorgeous and so chic. 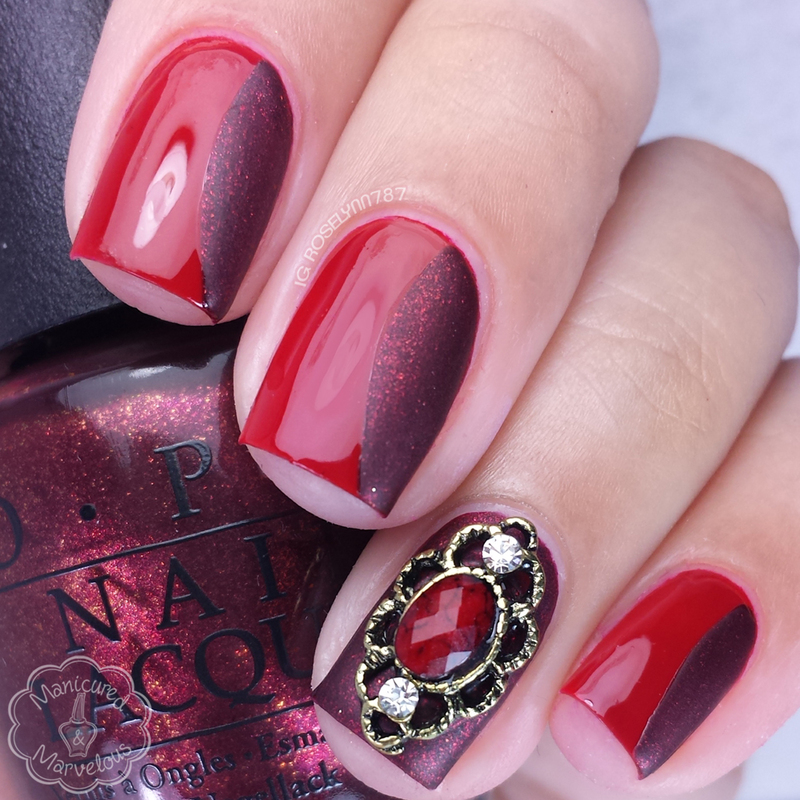 That's an amazing mani so feminine and gothic ! 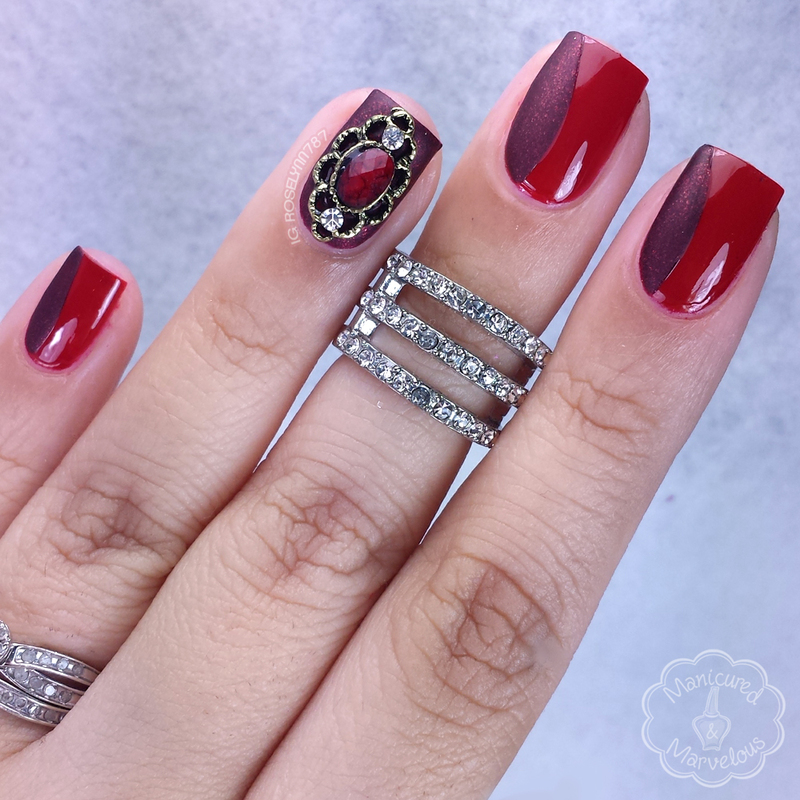 Wow, this is a sumptuous gothic holiday mani! Love. I love everything about this mani!!!! So stunning! Ooooh, so much amazing! Love the combo of matte and shiny. This is just so elegant! You always come up with such creative and interesting ways to create art with polish collections. Gah, these are gorgeous!! I love this! I adore this mani! It's elegant and chic. I also do that when I know that I'm going to be doing any nail art with vinyls, watermarbling or gradients lol. Wow, that is an amazing and unique style. Never saw anything like it. Wow! Gorgeous and perfect for the holidays. Love the nails . What a great look. Drool! I love how this turned out! That bit of matte really makes a huge difference!